hades, what tradeskill mod? gw? This is showing a profit for the two 85 ilvl359 engineering plate helms despite the fact that they are BoP. I was having this problem then started removing addons like gearscore/playerscore and outfitter.. then this addon and finally got the issue to go away.. then reenabled this addon and it returned. i don't see how that's at all possible. what makes you think it was lsw causing this problem? This mod was causing Inspection issues, where i would see my own items when inspecting other people. Also i would see different talents when inspecting or looking at my talent screen. lol. i'll take a look at the code. fwiw, lsw comes with hooks for skillet, atsw, the blizzard ui, and a couple others. gnomeworks has the lsw hooks as part of its package. it's kind of confusing, i suppose, but basically, lsw and gw are both hookable so the the hooking code could really be just about anywhere. I recently posted on the GW forum when it really belonged here, so I thought this time I'd be more careful and post in the right place. Guess I got it wrong. the sorting routines are handled differently depending on the ts frame. are you using gw or skillet? I've noticed that when I ask for the Value column to be displayed as a percent, and then sort by value, it still sorts by the underlying value (which is no longer visible) rather than the percent gain (which is). Is this the desired behavior? I was trying to use it as a quick way to identify recipes yielding the highest % profit. i'm confused. i just went to add these and they're already there. i musta mined after committing or something... strange. thanks, trtt. dunno why those aren't in the scrollID file. i just mined it recently, but maybe they weren't in wowhead's database when i did. For some reason i'm not getting any values for new cataclysm enchants, using auctioneer on my enchanting tab. 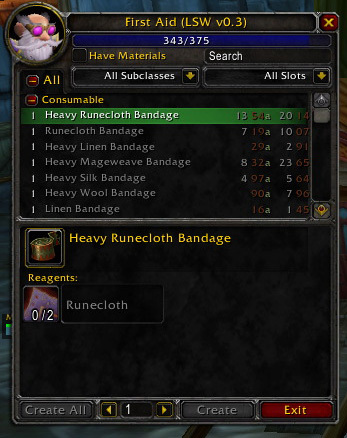 I can see the items on the AH and have tried rescan and the cache fresh on lsw but doesnt work.